George W. Bush Used Top Google Results For All His Paintings; Will He Be Sued For Copyright Infringement? Fix your mistake or make it worse? That's the question facing so many, so often. Let's make it worse, shall we? I mean, that's the way it frequently seems to go. And, why not, let's use that infamous "shut the hell up" multi-tool Copyright as well, so that everyone's respect for the concept continues its irreversible decline. Touch Arcade reports that Fox screwed up a little with its release of its new Family Guy game. But rather than move on, it decided to become a bully when it didn't immediately get its way. Earlier today, we assumed FOX soft launched the upcoming Family Guy: The Quest for Stuff. Folks on our forums, as they always do, downloaded the game, and started posting impressions and videos. Instead of embracing this sort of community activity, FOX apparently decided to go totally nuclear, shutting down absolutely everything they could that had to do with the game being posted anywhere. The "soft launch" was actually a botched delivery. New Zealand users weren't simply getting a headstart on the rest of the world. No, Fox simply pushed the wrong button somewhere and accidentally put the app out there for public consumption. As Eli Hodapp points out, nothing untoward or illegal happened, but the response was completely indistinguishable from that sort of situation. [K]eep in mind, Family Guy: The Quest for Stuff was fully available for download earlier today. No tricks were needed, nothing was stolen or otherwise pirated. Instead, people with New Zealand App Store accounts were just downloading the game like any of us download these games, direct from the App Store without any other associated drama. But Fox thought that, despite its misstep, it should still have control of the situation. So, it first asked a user via Twitter to remove his gameplay video from YouTube until "launch day," while admitting the game was availabe due to an error on Fox's part. 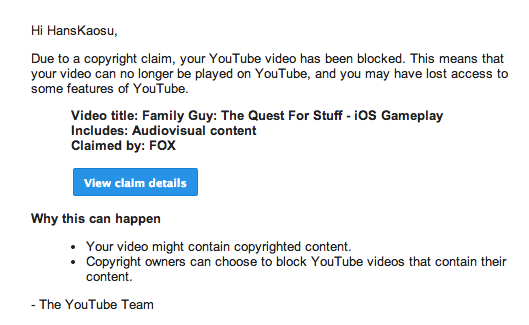 This user returned to his YouTube account only to find that Fox had already issued a copyright claim against his video. So, rather than be allowed to comply, the user received a strike against his account. Then, Fox went even further and had his Twitch channel shut down. Completely. As of the time of this writing, his account is still closed, supposedly due to "terms of service violations." Nice work, Fox. Now instead of people talking about the game, they'll be talking about how the entity holding the IP rights hammered potential fans in order to hold onto the game for another couple of days. And instead of giving one fan a chance to comply with its request, it decided to give him an undeserved YouTube strike and shut down his Twitch channel -- all because Fox failed to handle its own end of the app business. Ridiculous. I vote for Goat Simulator.